Every year the Horace Mann Middle Division brings together sixth graders who have made the journey “across the street” from our Lower Division and students who arrive from thirty-five public and private schools. They are introduced to a group of teachers and administrators chosen because of their commitments to middle level education. As the students and teachers interact for the three years of sixth, seventh and eighth grade, a lively community is formed. The three-year curriculum, and the facility it occupies, was designed for eleven, twelve, and thirteen-year-olds. The school provides a challenging program that will engage students who are growing through a variety of developmental and emotional stages, and who change from day to day as they experiment with who they are becoming. The intensity of their passion for learning is at a peak, and the program must keep pace with that energy, while providing support, encouragement, and affirmation. Academic disciplines in the Middle Division are organized both by department and grade level. Each grade level has faculty members who work as a team with a grade dean, and those same faculty members work within a department that guides the progress of children in a particular subject area for all three years. This coordinated approach guarantees the strength of each individual discipline within a cohesive and supportive environment. Middle Division Departments include English, History, Mathematics, Science, and Foreign Languages. In the quest to make connections, a wide variety of cross-curricular experiences are available. One of these experiences is the Classics program. Classics introduces students to Greek and Roman cultures, the study of Latin and its contributions to English and other romance languages, and the rich heritage of classical myths and tales. Other cross-curricular experiences include Summer Reading Book Clubs, Read-In, Williamsburg Trip and Art History lectures. During this period of transitions between childhood and young adulthood, the Middle Division provides the opportunity for students to begin making choices about the areas they wish to explore, and more opportunities for them to work at their own pace and to accelerate their progress if that is indicated. The Visual Arts, Music, Theatre, Physical Education, and Computing and Communications Departments are Middle and Upper Division departments and share the resources and facilities of both divisions, allowing a wider spectrum in those areas. Sixth graders participate in daily physical education classes that accommodate a wide range of abilities and interests and focus on intramural teams, physical fitness, and lifetime sports. During the next two years, students can continue to take these classes, or they can try out for a variety of interscholastic teams. Team practices take place during the school day, and games are generally held twice a week after school. Other school activities include Middle Mania, student publications, a variety of clubs, and a theatre production. 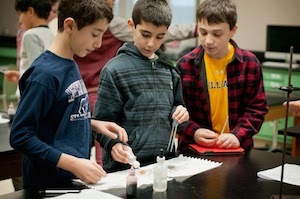 The Middle Division strives to include traditions and activities that are appropriate to students of this age. These include field day competitions between multi-age groups of students, poetry slams, talent shows, art exhibits, math contests, and field trips. These match the energy, enthusiasm and curiosity typical of young adolescents, and provide opportunities for dinner conversations with parents about the new educational adventures experienced each and every day. The young adolescents of the Middle Division vary greatly in their experiences, interests and abilities. Teachers work to develop skills in higher-level thinking, reading, writing, speaking and listening, as well as organization and time management. The academic rigor traditional to Horace Mann is balanced by opportunities for choices and individual expression. Students are supported academically by advisors who are also their teachers, subject area teachers available for individual appointments as needed, grade level deans, an Academic Center staffed by a reading specialist and a learning specialist, a guidance counselor and mentors. At each grade level, students are organized into homerooms with an advisor for each group. These advisors work with the Grade Deans and the Guidance Department as they focus on the individual experiences of each child and also the experiences of the group. All eighth graders participate in another unique community-building experience when they visit the John Dorr Nature Lab for an eight-day adventure-based program. While learning how to belay and climb the Cooperative Adventure Tower and organize and implement a three-day backpacking trip, the students learn through experience that the success of the individual is irrevocably intertwined with the success of the group. The Middle Division years are a time of important transition from childhood to young adulthood, and include an increasing amount of both independence and responsibility. Children in the Middle Division are in the process of experimenting with who they are and who they want to be. They are different from day to day, and that makes them an exciting group to work with, and also a challenge to guide and support. Expectations for conduct and behavior are clear, and the entire community works to create an environment where students can feel safe and accepted as they explore and develop. All of the adult members of the community provide guidance and discipline to safeguard that environment. Middle Division students have an increasing amount of free time, and during that time, they can take advantage of the indoor and outdoor spaces and facilities on campus. Students learn to make choices about how to spend that time. Much of the free time is social time, and this provides the geographically diverse student body with an opportunity to spend time together. Some of that free time is spent with teachers or in the Academic Center, a place for small groups of students to work on projects, meet with a student tutor, take a make-up test, use one of the school computers, or to do independent reading. Each year deliberate attention is given to one of our Horace Mann core values. Students are challenged to understand the meaning of the value, and to incorporate it into their daily life on campus. Students are expected to participate as members of the extended Horace Mann community outside of their grade level and division. Upper Division students serve as mentors, tutors, and role models, and eighth graders are encouraged to do the same for the younger students. Service Learning activities are organized by grade level and homeroom in sixth and seventh grade and give students another chance to give of themselves. In eighth grade, the Service Learning program requires all students to participate in a selection of group or individual activities on and off campus. They are expected to create a reflective piece to respond to their experiences. These service activities help students to experience the joy of giving of oneself to others. The Middle Division program at Horace Mann provides a unique opportunity to work with students at an exciting time in their young lives. As they explore their strengths and interests, and learn more about themselves, they continue to develop that interest in and love for education that will serve them well for the rest of their lives. The Middle Division provides young men and women with the foundation they need to move on to the next levels of education, confident of themselves and their abilities.